Eddie the Eagle is a movie based on a true story from a boy with a dream to compete in the Olympics. Not only does he not have the talent from the start, but he doesn't have much support either, except from his mother and himself. Sure, his dad doesn't stop him from doing what he wants but he'd rather have Eddie working in the family plastering business. This doesn't stop Eddie and you get to see the hardships and dedication he goes through to chase his dreams. Eddie is played by the rising star Taron Egerton known for "Kingsman: The Secret Service" and if you compare him to the real life Eddie he just about nails the part perfectly in looks and mannerisms. Eddie has some downfalls in the beginning and loses hope of making the grand stage of the Olympics until he figures out that there's an event he hasn't tried yet: ski Jumping. Britain has only had one ski jumper before so he has a shot in making it. The task is not easy and, after much pain, he is then in need of a coach. That's when Hugh Jackman's character comes into play as Bronson Peary, a washed-up drunk who used to jump for team USA. He refuses to be Eddie's coach but seeing Eddie and his determination, accepts the task and the real work begins. Not only does Eddie have to prove himself worthy, he has to prove to those doubters that he can make the team and participate. Britain certainly does not like this and makes it hard for Eddie to make the final team by increasing the length of a qualifying jump seem all but impossible. 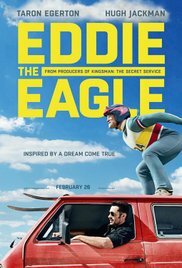 Go see Eddie the Eagle and enjoy the inspiration it gives. The ending had me all teary-eyed with joy. If that doesn't say anything about this flick then I don't know what does. This flick is worth seeing on the big screen. Hugh and Taron were great together. Eddie the Eagle will be a film I own when it comes out.